RDA Central West in conjunction with CASE, the Canobolas Academy of STEM Excellence held a STEM Industry Partnership Program (SISP) Design Thinking Workshop at Orange Agricultural Institute on Monday 12th November 2018. The course facilitator and teacher was Glenn Lawrence a knowledgeable educator who loves helping students design and create. Professionally, Glenn has worked as an industrial designer in both Australia and China and has over 10 years of experience as a TAS teacher in NSW secondary schools. 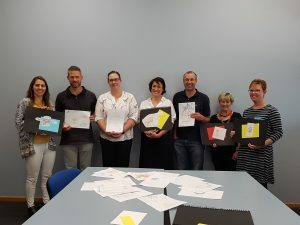 The course was designed for Primary School teachers involved in Positive Behavioural Learning (PBL), Science Technology Engineering the Arts and Mathematics (STEAM) or Science Technology Engineering and Maths (STEM) subjects. The strategies and tips delivered during the course empowered teachers to successfully lead students through the design thinking process. The course included exploration of how design thinking is represented in the syllabus and why it is essential for STEAM innovation. Teachers also learnt the four basic shapes of design, and gained ‘hands on’ experience using the shapes to ideate/design and visually solve problems. Teachers were also taught about storyboarding to communicate the design thinking process, how to apply drawing and storyboarding techniques to create solutions for a real-world problem, as well as creating a visual tool kit to improve visible thinking skills and spatial reasoning. This workshop was made possible through the support of Google. This entry was posted in Events and tagged Design thinking workshop, maths, science, SISP, STEM, students on November 15, 2018 by RDA Central West.